In a milestone ruling that potentially signifies a reawakening of the Iraqi judiciary as an independent force in Iraqi politics, the federal supreme court has ruled that the current bylaws of the Iraqi parliament, now under revision, are in conflict with the constitution. Specifically, responding to a query instigated by Iraqiyya and its new speaker of parliament, Usama al-Nujayfi, the court says that the notion of a collective, three-man presidency of the parliament is at variance with the vision of pre-eminence for the speaker himself in the constitution, with his two deputies filling more auxiliary roles. The bylaws of the Iraqi presidency, adopted in the heyday of ethno-sectarian quota-sharing in 2006, went further than the constitution in reproducing the paradigm of tripartite consensus in Iraqi politics. Whereas the constitution enables the election of the speaker separately from his deputies and without any special majority requirements, the bylaws create the “presidency of the parliament” as an institution that to some extent must act in concert when it comes to setting the agenda of the parliament. Importantly, whereas the vision of the speakership in the constitution seems clearly majoritarian, the bylaws, through the collective presidency, in several instances in the previous parliament enabled dissatisfied factions to obstruct or at least delay legislative projects with which they were unhappy. To Iraqiyya, this ruling by the court should serve as a reminder of the significance of the speakership that they received as part of the political agreement clinched on 10 November. At, the same time though, it would prudent of them to be aware that their logic of an orthodox reading of the constitution will probably apply with equal force to another institution that is much debated these days: the national council for strategic policies, which was identified in those talks as the keystone of Iraqiyya’s participation in the next government, but which is not even mentioned in the constitution – precisely like the “[collective] presidency of the parliament” which Iraqiyya complained about to the supreme court. That in turn obviously raises the question of what sort of political participation constitutes the best strategy for Iraqiyya in the coming parliamentary cycle, with two tendencies already discernable within the party and sometimes within the same politicians! For example, Nujayfi has fronted the bid to boost the powers of the speakership as a national institution, and yet on other occasions has resorted precisely to the logic of ethno-sectarian quota sharing (muhasasa) that he tried to avert in the case of the speakership. By way of example, he has discussed the idea that Yazidis and Turkmens should have representation in government on an ethno-sectarian basis, and has charged a 3-person committee (Sunni, Shiite, Kurd) with preparing a draft law for the projected council on strategic policies. Other Iraqiyya representatives from Diyala have even made the point that their governorate needs to achieve representation in the next cabinet! By pursuing this kind of thinking to its logical conclusion, Iraqiyya would end up making a “component” (mukawwin) of every faction and village in Iraq, thereby contradicting the very nationalist values that supposedly formed the basis of their recent election success. At the same time, the inflationary pressures of Iraqi politics mean that the next Iraqi government is going to be a densely populated body: Already, ISCI with its 18 deputies says that should equate “4 to 5 service ministries”; Iraqiyya itself says it expects around 12 ministries (91 deputies), whereas the all-Shiite National Alliance is talking about 20 to 25 ministries for itself. We have not even mentioned the Kurds so far, but do the math and we are looking at an overcrowded government potentially so weak and fragmented that Iraqiyya would probably do better in a purely opposition role. Meanwhile, other parties are apparently discovering potential problems in the deal they agreed on 10 November. Apparently, a query is being considered by the supreme court regarding the veto powers of the president, with the Kurds apparently disconcerted that these prerogatives are now gone. Other reports say Iraqiyya plans to introduce a law on the powers of the vice-presidents, which again are not defined by the constitution. Hopefully the recent ruling by the supreme court means it is now in a better position to adjudicate this rush of greedy office seekers than it was just half a year ago. This entry was posted on Sunday, 5 December 2010 12:13 at 12:13	and is filed under Iraqi constitutional issues. You can follow any responses to this entry through the RSS 2.0 feed. Both comments and pings are currently closed. Kurds want equal amounth of ministries to their population, which is 23%, so in case of 5+12+25=42 the Kurds would want 42/77 x 23 = ~13 ministries. so seems like we’re looking to having 55 ministries? That would be ridiculous. > Here in Australia we are a constitutional federation founded at the turn of the 20th century. from 6 states (governorates)and central government. We have a federal election every three years and every cabinet formed from those elections invariably includes ministers from each state. So there is nothing strange to me about Iraqiyya’s Diyala reps trying to get representation in the cabinet. This is just routine politics. > I would caution those who keep promoting “majoritarian rule” for Iraq that the shia parties combined were only four seats off obtaining a majority in the COR last January. And if they ever succeed in obtaining that majority then they will be able to elect President and Speaker as well as Prime Minister from their own ranks. Am not certain that would be a helpful development at this early stage in the development of the first arab democracy. The adoption of the PR voting system was designed to ensure power-sharing, not majority rule, and it is the UN preferred model for all developing countries transitioning to democracy in order to increase the stakeholders. > Personally I feel that Iraqiyya rejecting coalition and instead turning itself into an Opposition would be the entrenchment of highly adversarial politics and would reignite shia baathist conspiracy theories. Fortunately it seems Iraqiyya knows that its best interests, and the country’s, are served by being in the govt, not out of it. Certainly at this stage. Bb, remember that Diyala is not a federal state, it is a governorate. Iraq has 18 governorates. In Basra, the qadas of Qurna and Zubayr think they should be governorates of their own. Imagine if each “local government area” in Australia should demand seats in the govt. Add to that the numbers, as you can see from Kermanshahi’s comments above, and they do not even include micro minorities or the claims of Tawafuq or Unity of Iraq. Accommodate all of this, and you will have the world’s biggest government ever, formed after a process that took longer than any other previously recorded. What a democracy! More fundamentally, the basic problem in your comment is the postulation that politics in Iraq is always pushing in a sectarian direction. 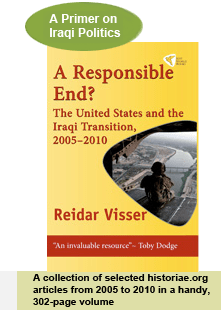 If you had studied Iraqi history, or even taken care in analysing the post-2003 situation and developments between 2008 and 2009 in particular, you would have understood that sectarian politics is not the default setting of Iraqi politics but rather an exception that results from extreme external pressures. But like many of the “UN experts” that have been on the loose in Iraq after 2003, you ignore all of this no matter how overwhelming the empirical evidence, preferring instead to reiterate your own theories about consociational democracy over and over. This is why we American conservatives hate govt bureaucracy. Actual governing takes a back seat to self-enrichment of the politically connected on the backs of those of us that work in the private sector and actually produce the nation’s wealth. Bb – you really come across as being clueless about Iraq. If what you say and what you are suggesting was even remotely true then Maliki would have formed a government a long time ago. To speak of a monolithic shia community that could dominate Iraq in the way you do is simply not grounded in fact. In relation to the FSC’s decision – one small point is the amount of time that it took for the FSC to render its decision (a matter of days). Compared to the delay in rendering a decision on the first session of parliament, there does appear to be a problem. At the same time however, I wonder if our friends in the FSC are simply doing the best they can in difficult circumstances. We are gradually (albeit very slowly) building a number of rules that are claryfying Iraq’s constitutional framework, which at the very least has the merit of reducing uncertainty. The COR is trying to circumvent the Supreme Court’s rule by voting the speaker and his deputies combined, do they have a legal basis? And the Kurds and INA are the only ones who do that? Maliki breaks the constitution whenever he can and only uses it when it benefits him, infact all parties have shown they are like this. Kermanshahi, I wrote NA not INA and as far as I know Maliki is reckoned as a central figure in the former. Reidar, Once upon a time I thought ISCI was the bedrock of the greater Shia block. What lead to their apparent desertion? Were the Iranians not able to pull them in line like the Sadrists? Jason, note that your report is from October. These days, ISCI are flocking back to take posts in the Maliki govt. There are personal issues between Maliki and Hakim (and Maliki and Jalal al-Din al-Saghir), but the pro-Iraqiyya “bloc” in ISCI mostly seemed limited to Ammar al-Hakim and Adel Abd al-Mahdi. And of course, there is the general weakening of ISCI in the 2009 local elections and the last parliamentary ones.